Aluminum Fencing Can Do It All! Aluminum fencing is the way to go if you’re budget-conscious and need a high quality, durable fence! What’s the first thing you think of when you think of fencing? Chances are you think of a beautiful white wooden picket fence lining the front lawn of a home. Or maybe you think of a strong-looking wrought iron fence in front of a commercial property. If you’ve been looking at installing a new residential or commercial fence, consider going with one made of aluminum. Aluminum fencing is strong, requires very little maintenance, and has many other benefits you may not have thought of! A fence made of aluminum is extremely versatile and can be adapted to any landscape. You can use it on flat surfaces as well as sloped land without worrying about unsightly gaps or awkward transitions. It can also be designed for any residential or commercial use imaginable and follow any local codes governing their design. Aluminum fencing is not chemically vulnerable to corrosion, so you won’t need to worry about rusting, rotting, or fading like you would for iron or wooden fences. It won’t be broken down by the elements such as snowfall or hail. Outside of occasionally spraying the fence down with a hose to clean off the dirt, you won’t need to perform regular maintenance on your aluminum fence. Aluminum fences are great for residential uses! Your fence may act as a barrier to confine kids and pets within a certain area or provide security around a pool or hot tub area. You can trust that your aluminum fence will stand strong for many years, providing you the peace of mind you’re seeking. Because aluminum is cheaper to manufacture, the fences we can make with the material are less expensive than iron fencing, making it a good material to consider if you’re on a budget or need a longer fence. And if you’re looking for fencing that is environmentally friendly, you can have it made with recycled aluminum. 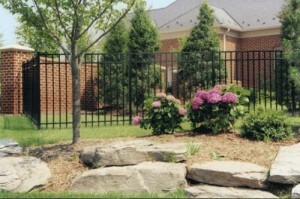 Hercules Fence Northern Virginia has countless fencing options for your business and commercial property. Whether you’re excited about a beautiful ornamental aluminum fence or already planning out your custom wood commercial fence, we are ready to help you frame and secure your property. Hercules Fence Northern Virginia has been providing homeowners with quality fences for over 50 years. We are well equipped to meet your needs, whether they are residential or commercial. Contact us to see how a chain link fence can protect your property by giving us a call at 703-551-2609 or visiting us online. To see examples of our work, follow us on Facebook, Twitter, Google+, LinkedIn, Pinterest, and Flickr. This entry was posted on Tuesday, September 27th, 2016 at 7:14 pm. Both comments and pings are currently closed.